ST. LUCIA (April 15, 2016) – Jade Mountain, the unique St. Lucian resort known for its open-air sanctuaries and picture-perfect panoramas, has landed a spot on American Express Travel’s list of the world’s top 25 hotels offering a “Best in Class” customer experience. The exclusive “Top 25” list was selected from the portfolio of more than 800 luxury getaways worldwide recommended by American Express Travel’s Fine Hotels & Resorts. The winning hotels were chosen by an elite group of globetrotting experts: the editors at Departures magazine, American Express Travel Counselors and members of the company’s executive team. “These are all hotels that deliver extraordinary experiences to our Card Members,” American Express told the winners in a statement. “We are deeply gratified to be recognized by American Express as their choice for Most Breathtaking Views and to be in the company of some of the most acclaimed hotels in the world,” said Karolin Troubetzkoy, executive director of Jade Mountain and its adjacent sister hotel, Anse Chastanet. From the outset, the goal of owner and architect Nick Troubetzkoy has been to showcase St. Lucia’s unrivaled beauty. The mountainside rooms, each with a wall open to the elements, are designed like prosceniums that perfectly frame the waters of the Caribbean and the twin Piton peaks, all part of a UNESCO World Heritage site. With its mesmerizing panoramas, generously sized infinity pools and details such as carefully handcrafted furnishings sourced from local materials, each room is a majestic, sweeping space that’s a true work of art. 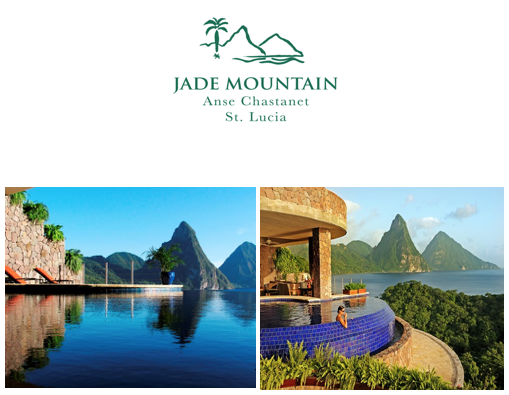 “Jade Mountain is a labor of love and a fitting tribute to St. Lucia’s exquisite beauty,” said Mrs. Troubetzkoy. Both Anse Chastanet and Jade Mountain have been named among the world’s top Caribbean hotels by Condé Nast Traveler and Travel + Leisure magazines.